Internationnal customers price is € 1540.83. Délai de livraison (vers la France) : 10 jours. 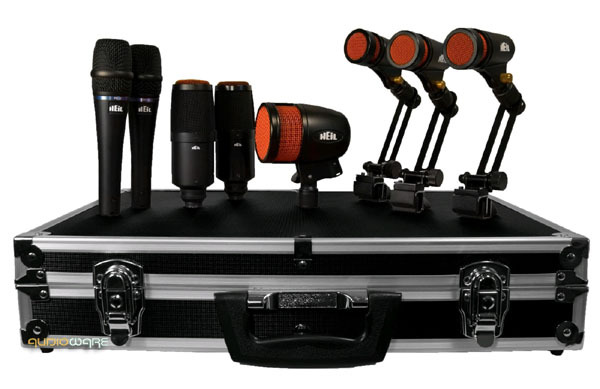 The Heil Sound HDK-8 Drum Microphone Kit gets you fully equipped to mic your drum kit right. It comes with 2 PR 22s, 3 PR 28s, 2 PR 30Bs, and a PR 48, giving you enough mics for a larger kit. It also comes with 2 special HH-1 mounts for toms, 2 HM mic clips, and a black hardshell carrying case. The Heil HDK drum mic kit series is a culmination of over 2 years spent on the road with leading drummers. They gave Heil their ideas, dreams, and needs which Heil then turned into reality. Every component of a drum kit needs special attention when it comes to reproducing the sound accurately. There are many drum microphones out there, but the artists that helped design the Heil drum microphones wanted more accuracy, not just level. Each one of them were tired of little plastic toys that did not reproduce well. They all agreed, after hearing and using the new technologies of the Heil drum microphones, that they had never heard this level of quality reproduction. This special Spotlight Series edition of the Heil Sound PR 22 delivers the same outstanding versatility and range of the original. This microphone though, comes in several slick colors. The Heil PR 22 Mic represents completely redesigned dynamic microphone technology designed for a wide range of professional applications such as live sound, commercial broadcast, and sophisticated recording. The microphone's wide frequency range and outstanding, low handling noise outperforms the tired, 30+ year old industry technology and can withstand huge amounts of SPL. The end result is a microphone that can answer the call to any application. For example, the gorgeous upper mid range makes the Heil PR 22 among the best live vocal microphones, while its outstanding frequency response and superb dynamic range suit it perfectly for use with a snare drum. Since 1982, Heil Sound has been ranked with the leading manufacturers of communications microphones and has a paramount understanding of phasing. When properly applied, this knowledge creates outstanding cardioid patterns with unbelievable rear rejection that removes unwanted sounds that try to enter from the off-axis rear. Its pattern control is outstanding. This exceptional performance is achieved by using the ideal combination of materials for the large low mass diaphragm and a special mixture of neodymium, iron, and boron that gives the Heil PR 22 mic the strongest magnet structure available. In addition to the special magnet structure, the Heil PR 22 microphone achieves its exceptional performance by using a large 1-1/8" low mass voice coil assembly with a very unique internal sorbothane suspension system that has been designed to reduce undesirable handling noise. Special attention has been paid to the phasing plug assembly with equally placed ports that sense audio from behind, entering them out of phase. Thus, it produces a very linear cardioid pattern and reduces the proximity effect while achieving perfect articulation. This Heil element is usable in extreme high sound pressure levels and is immune to overload conditions, making this dynamic mic perfect for vocal and live sound applications. Just like the PR 22, the Heil PR 30BB represents completely original dynamic microphone technology designed for a wide range of professional applications such as sophisticated recording, live sound, and commercial broadcast. Its smooth, wide frequency range sounds like a ribbon but can withstand large amounts of SPL. Outperforming the tired, 30B-year-old technology of the industry, the large diameter of the PR 30B's dynamic element produces an outstanding upper mid-range that makes the PR 30B an ideal guitar microphone, while still an excellent choice for reproducing the human voice. The pattern control of the Heil PR 30B mic is outstanding. This exceptional performance is achieved by using the ideal combination of materials for the large low-mass diaphragm and a special mixture of neodymium, iron, and boron that gives the PR 30B the strongest magnet structure available. These features allow the microphone to achieve magnificent dynamic range. A unique screen system using two different diameter mesh screens and an internal breath blast filter allow the user to talk closely to the microphone with little worry of pops or excessive sibilance. The large diameter dynamic element is mounted in a unique sorbothane shock mount atop a non-resonant fixture, decoupling the element from the massive steel body. This body and the internal humbucking coil removes any worry of using the PR 30B near monitor screens or noisy lighting fixtures and controls. The technology of the Heil PR 30B has redefined the dynamic microphone with superior wide frequency response, low presence of noise, flawless design, and elite quality expected by an innovator and leader in the field. The PR 48 kick drum microphone starts with Heil's 1.5" large diaphragm dynamic element sealed in a vulcanized shock mount and fed with a specially designed low-pass filter that creates a 10dB rise from 60Hz to 100Hz — right where the kick drum resonates. It stays out to 7.5 kHz and drops off drastically to eliminate any unwanted internal sounds. The total frequency response is 30Hz - 8.5kHz (4dB rise @ 4500Hz). Its rear rejection is -40dB @ 180° off-axis. It can handle +148dB SPL. The PR 48 mic metal housing was designed with a slanted entrance to the 3-pin XLR so the cable assembly is easier to connect. The drum microphone provides a 600 ohm balanced output. The PR 28 is Heil's premier drum microphone. Its tight cardioid pattern, wide frequency response, and stellar rear rejection make it ideal for toms, snares, bongo, and many other applications. A unique dual suspension system between the actual dynamic element and the grille and body reduce unwanted vibrations. The HH-1 is a unique mounting kit that is fully adjustable so you can mount a Heil PR 28 on the rim of the mounting hoops of the tom drum. Heil PR 22 Mic Frequency Response: 40Hz to 18,000Hz Impedance: 400 ohms balanced Output level: —55dB @ 1,000Hz Net Weight: 14oz. Heil PR 30B Mic Frequency response: 40Hz - 18kHz Polar pattern: Supercardioid Impedance: 600 ohm balanced Output level: -52.9dB End fire generating element: 1-1/2" diameter dynamic Polarity: pin 2+ Magnet structure neodymium, iron & boron Case structure: steel Dimensions: Length: 6.25" Diameter: 1.75" Stem diameter: 15/16" Weight: 9oz.